Mountain agriculture is a socially and culturally unique system, but also a regionally important economic sector. In a globalising world, it is clear that fertile areas on all continents will always be used to produce large quantities of agricultural products in order to feed the world and, increasingly, provide biomass as a source of energy. It is far less clear, however, how land use in steep and more peripheral regions will evolve. By definition, farmland in mountain areas is more difficult to work because of steep slopes and missing accessibility. Climate conditions and poor soil quality often add to these adverse conditions. 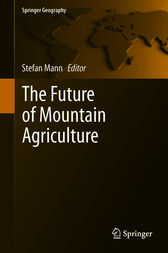 Through overcoming limited views from one region only or from one discipline, this book intends to draw a first truly international perspective on the issue of mountain farming.